There are a lot of things to like in the above chart of the gold/SPX ratio since 1998; perhaps most notably the Relative Strength Index (RSI) has been forming higher lows since the 2013 gold crash and the monthly-RSI(14) has recently broken above the downtrend line drawn from its Global Financial Crisis peak (10 years ago!). The Chaikin Money Flow (CMF) was a good signal when gold was peaking and beginning to roll-over in 2012 (bottom of above chart), it could be offering a similar signal that the gold/SPX ratio is at the end of its bottoming process right now. 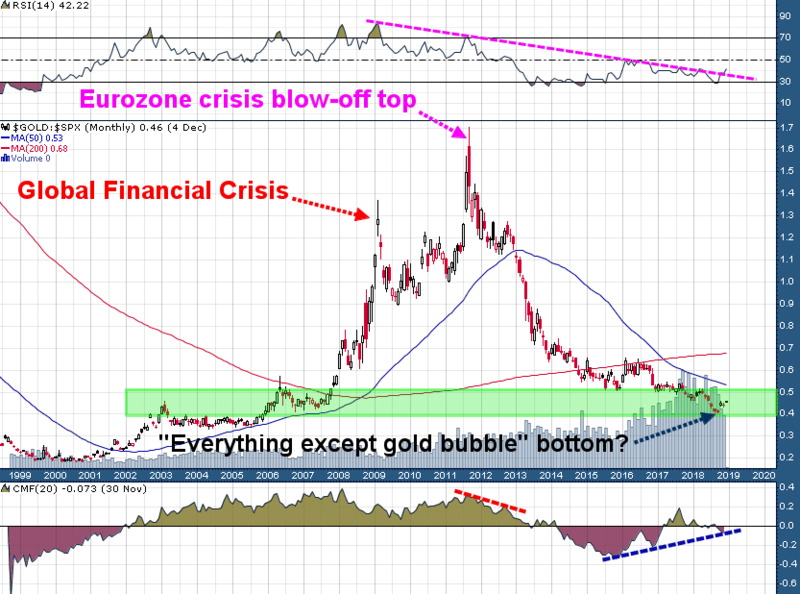 Without understanding anything about technical analysis it would make sense that the value of gold relative to stocks peaked during two periods of extreme economic turmoil (2008/2009 Global Financial Crisis and the 2011 Eurozone Crisis), just as it would make sense that the value of gold relative to stocks would reach an extreme low during a period in which virtually every other asset class went into a bubble (cannabis stocks, crypto, FAANG stocks, etc.) and there didn't seem to be any need to worry about downside risks in anything. 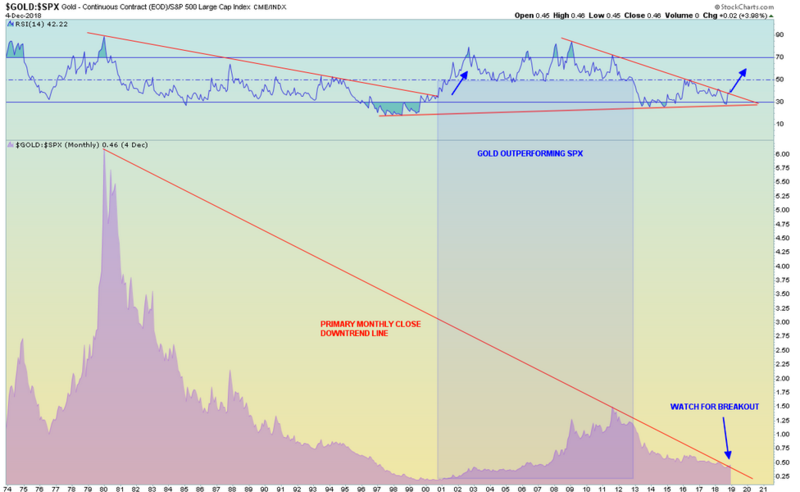 Could we have just witnessed the "Everything except gold bubble" bottom in the gold/S&P 500 ratio? That's a 38 year downtrend line drawn in red! For those who want to keep an eye on this ratio over the coming weeks, it's currently at ~.46 (gold $1240, S&P 2700) and it would be significant if the ratio closed above .51 on a weekly closing basis with a much bigger long term level up at .60. For now, the key levels are support at .40 and resistance at .51. Those who want to express a bullish view of the gold/S&P ratio in the market can go long GLD and short SPY in equal dollar amounts (more aggressive traders could also use gold/S&P futures to put this trade on).